Ceramic tile, porcelain tile, tumbled marble tile, white, black, blue, and green tile…We’ve got a lot of tile! Which got us thinking of some other ways we could creatively repurpose it. Why not a tic tac toe tile board! Here’s how you make it! First things first, measuring! 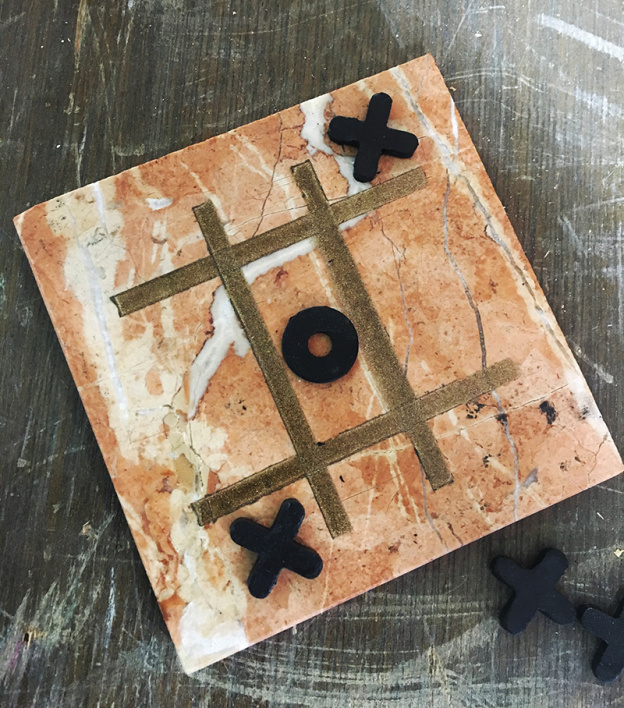 You’ll want to measure and layout your tic tac toe board design before you start painting. 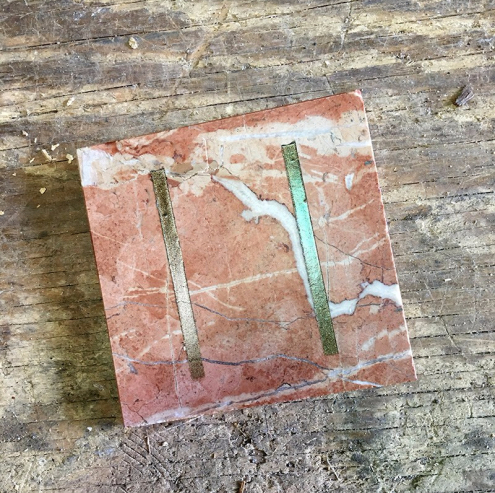 We used a 4″ x 4″ piece of tile and marked the tic tac toe lines 1″ from the edge vertically and 1.5″ from the edge horizontally. Keep in mind the thickness of the lines, our lines are 1/4″ thick. Once you’ve settled on a layout for your board use a pencil to mark where the lines will go. Next, cover the tile with painter’s tape to leave one set of lines exposed for spray paint. 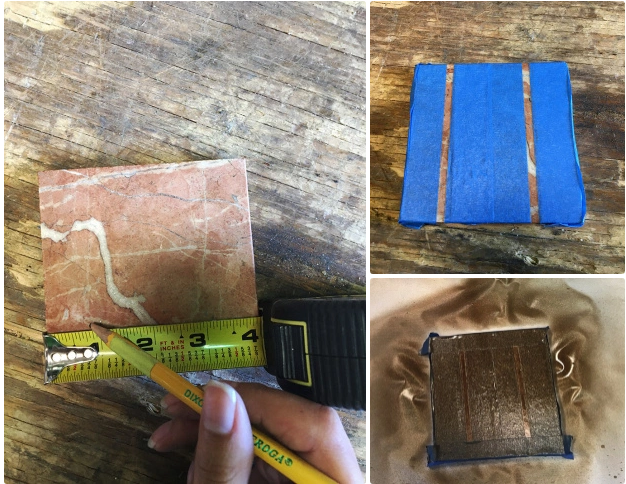 We had copper spray paint on hand but if you’re using a paint marker you can simply draw the lines on the tile using a ruler and skip the painters tape step. Before you begin painting make sure your tile surface is nice and clean! If you are going the spray paint route make sure to tape off the edges of your tile so you don’t get paint where you don’t want it. Start painting! Let the spray paint dry for a few hours before peeling off the painters tape. Once you’ve peeled off the tape repeat the steps above to do your second set of lines. 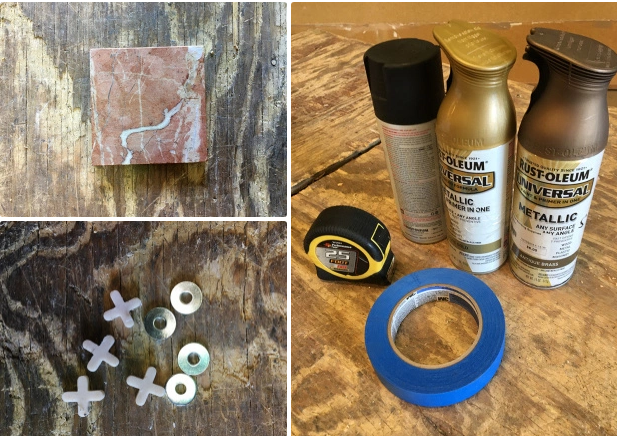 While your tile is drying you can spray paint your tic tac toe pieces. We chose to paint the washers and tile spacers all in black but you have endless possibilities. Maybe spray paint one side with one color, and the other side another color. You’re almost done! After you’ve waited a few hours for everything to dry you’ll have a complete tic tac toe game board. But before you begin playing we suggest applying a sealer to protect the paint from any scrapes during those heated tic tac toe matches! Have fun!